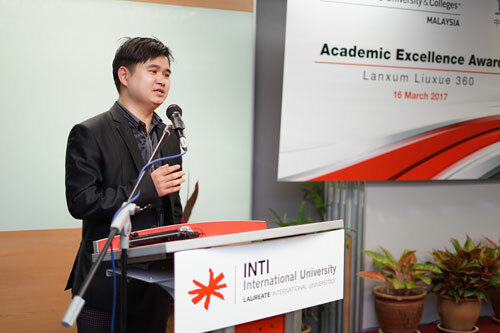 INTI International University & Colleges recently hosted distinguished guests from Lanxum Liuxue 360 Education to attend an Academic Excellence Awards and present the scholarships valued at over RM66,000 to 20 top scholars from China. (From L-R) Mr. Michael Chan, Assistant Vice President, Sales (International Business) of INTI International University & Colleges; Mr. Roy Heong, Senior Vice President, Sales of INTI International University & Colleges; Ms. Liu Wen Hua, Southeast Asia Marketing Director of Lanxum 360 Education; Mr. Tim Bulow, CEO of INTI International University & Colleges; Mr. Luo Cheng, CEO & Founder of Lanxum Liuxue 360 Education; Mr. Ma Ding, Vice President of Lanxum Liuxue 360 Education; and Mr. Wang Qi Jing, Board Member of Malaysia Department of Lanxum Liuxue 360 Education. Guan Yan Peng, Bachelor of Business, major in International Business; Wei Wei Zheng, Bachelor of Commerce, in collaboration with University of Wollongong Australia, major in finance; and Pan Neng Qi, Bachelor of Commerce, in collaboration with University of Wollongong Australia, major in finance were each awarded scholarships worth RM5,000. They are the top 3 scholars who received the highest scholarship. Other scholars were awarded scholarships worth RM3,000 each. Mr. Luo Cheng sharing his entrepreneurial story with students. “We are honoured to have Lanxum Liuxue 360 Education here with us today to offer these scholarships to our outstanding students. Your contribution will go a long way in enabling our students to complete their studies and to help them make the most of their experience with us,” said Bulow. “The scholarship is set up to encourage students to study hard, develop their excellent ability as well as strive for their home country. 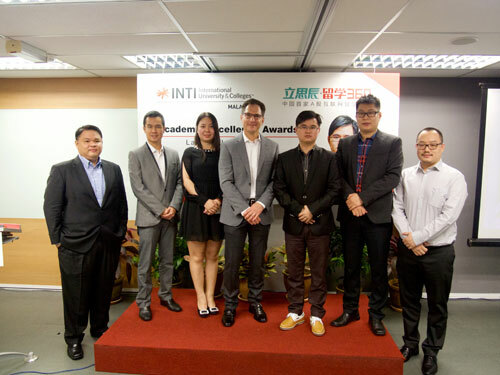 We look forward to working closely with INTI as it provides an exceptional international learning experience for these future leaders,” said Mr. Luo Cheng. In line with INTI’s focus in producing and equipping graduates with skillsets for jobs of the future, INTI endeavours to help its students be more employable and increase their employability prospects. Launched in 2015 and validated by BDO Governance Advisory, it is known that 98% of INTI graduates are employed within 6 months upon their graduation. Additionally, 82% of INTI graduates are paid higher than market average and 25% of INTI graduates are offered jobs before they graduate.